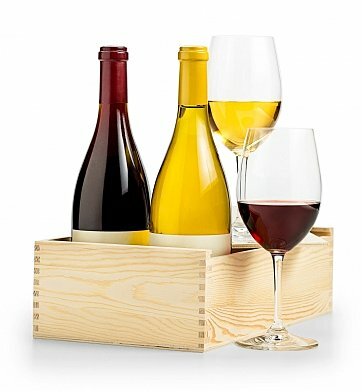 An enduring signature wine crate is filled with a hand-selected duo of red and white wine, each chosen for their mouthwatering flavors and beautifully balanced textures. The sommeliers at GiftTree take great care in customizing each wine crate, creating a charming gift for the wine lover in your life. One bottle each of Red & White Wine. Measures 14" x 8" x 4". Sommelier's Red and White Selection is a hand delivered gift. These gifts are delivered by one of our local design centers located throughout the United States and Canada. Same day delivery is available for most gifts when ordered before the cutoff time. The cutoff time for Sommelier's Red and White Selection is 1 PM in the recipient's time zone. First Press ChardonnayA medium-bodied Chardonnay that shines with yellow apples, pears, and a textured finish. Elegantly structured, this medium-bodied Chardonnay has aromas of lemon, spice, melon and a touch of vanilla. Flavors of yellow apples and pears lead to a textured, well balanced finish. Let the expert sommeliers at GiftTree curate a duo of velvety red and crisp white wine for your favorite wine drinker. Two sommelier-selected bottles of red and white wine. Arrives presentation-ready in our signature duo gift crate.